Yesterday on the Stonemaier Games monthly e-newsletter (read it here and/or subscribe here), I shared a demographic survey with our 34k subscribers. The intent was to learn more about our followers beyond just those who actively engage with us on social media. I focused on questions with actionable results, and I retired some questions from last year’s survey if I felt like I already had the information I needed. Some of the data in the survey really piqued my curiosity, so I thought I’d share it with you here, along with my conclusions and questions. Unlike most of my articles, which focus on entrepreneurship and crowdfunding, this is mostly about tabletop games. When I design and publish games, I think about the “learnability” factor all the time. I talked about this in detail in a Sunday Sitdown YouTube video a few months ago. Basically, I want to make it as easy as possible for someone to (a) get the game to the table for the first time, (b) teach the game to a variety of people, and (c) remember the rules to the game so they can continue to get it to the table without feeling like they have to relearn it every few months. I’ve also found that as a gamer, if I need to learn a game to teach it, all other factors being relatively equal, the shorter the rulebook, the more likely I am to learn the game. Of course, all other factors aren’t always equal–I get excited about some games more than others, just like anyone else. But sometimes I need to make that choice, and the length of the rulebook impacts that choice for me. So I wanted to see if other people felt that way. The actionable point I was considering was printing the length of our rulebooks on the bottom of the game box, just in case it’s an influencing factor when people buy games. But as you can see from the data, a majority of people simply don’t care about the length of the rulebook. My hunch is that they would prefer a well-composed rulebook with plenty of examples that serves both as a teaching tool and a reference. What do you think? The BoardGameGeek rankings are, in my opinion, an incredibly powerful sales tool. For those of us who are fully immersed in the world of board games, I think we sometimes forget that new people enter this world all the time. If they discover BoardGameGeek, where do you think they look to discover which games they should try for the first time? The rankings. So I was curious to see how many people actually rank games, with the actionable point being that if the percentage was low, I might remind subscribers a little more often to actually rate our games. The results are heavily skewed because they’re being answered by people who subscribe to a gaming e-newsletter AND who are willing to provide their information in a survey. Basically, the type of people who are likely to rate games on BoardGameGeek. I would guess that the actual percentage is even lower. How would you act on this data? As you may know, an integral part of the Stonemaier Games brand–as noted on our submission guidelines–is that we only publish games that play at 2, 3, 4, and 5 players (ideally 1 and 6 as well). The reasons for this are (a) we want to publish games that can be enjoyed both by couples and larger groups and (b) we want our games to get to the table as often as possible–the chances of that decrease if you have a tighter player range. However, the problem with this strategy is that it often costs more to include the components for 5 and 6 players, but game buyers don’t necessarily factor that when considering the value of the game. So I’ve been shifting more towards the 2-5 player range, adding the 6th player–when appropriate for gameplay–to the expansion. The data further confirmed that strategy. It seems that about 33% of people like the possibility of playing up to 5 or 6 players, while 66% primarily play with a total of 1-4 players. Do you factor in player count when buying games? These two charts go hand in hand. I asked a similar question last year, though I asked this year’s question in such a way that makes it difficult to compare. I’ll be more consistent in the future. I’ve had a theory this year about campaign and legacy games that require multiple sessions to play. It’s no secret that some of the most successful and highly rated games are campaign games (Gloomhaven and Pandemic Legacy). I suspect that a lot of people love the idea of campaign games because of the epic scope of them and the stories they’re able to tell. But I also know that it can be difficult to get together a regular group for a campaign game. For example, I host a weekly game night, and I often play games on the weekends. But they’re not for campaign games. We set aside another day when possible for campaign games, so we’re limited to a certain number of them this year. In the past year, for us that included only Pandemic Legacy Season 2, Scythe: The Rise of Fenris, and The Rise of Queensdale. We also play TIME Stories, but not over multiple sessions. So I posited that there is a limit to the number of campaign games that most people will even consider buying, meaning that people are less likely to buy campaign games than they are non-campaign games. If my hypothesis was correct, it might impact the number of campaign games we make in the future (though, Charterstone and The Rise of Fenris have combined to sell well over 100,000 copies, so I can’t ignore that). I was pleasantly surprised that nearly 50% of respondents indicated that they’ve played between 2 and 5 campaign games this year. That’s encouraging to me for the future of campaign games (though it also doesn’t debunk my theory). What do you think? While this data is specifically focused on people who follow Stonemaier Games, if you don’t get the e-newsletter, you’re still welcome to fill it out here. One of my least favorite game learning experiences was a medium weight game with a 3 page rulebook. No pictures, no examples, just dense text. So rulebook length wouldn’t convey enough information to me to have an impact on purchasing. Examples, summary charts, images can all make a rulebook lengthier but more amenable to learning. I’ve walked away from some very awesome looking kickstarters due to the length of the rulebook. I’ve done my time in the trenches with StarFleet Battles, Ogre, Car Wars, etc. and I’m done with hugely complex games….Something with 8-16 pages is ideal. 1) I think the length of the instructions isn’t the problem. Star Wars Risk has a fairly short book, but there are so many situations that arise that we have to make up our own rules for. Imperial Assault has pages and pages of rules, but it takes a lot of work to understand what they are getting at, and even then it’s not really clear sometimes. Short or long, what I really want are straightforward rules that I can feel confident about. I think the Scythe rulebook does a good job in this area. I can teach it fairly quickly, but there are lots of info and examples and such that I can refer to when needed. 2)I think BGG ratings are overrated? I do rate games, but now that I think of it I don’t ever look at ratings when I’m considering buying something. I do, however, watch video reviews of games so I can get a feel for how they play and if I think it would be a good fit with my gaming circle. 3 and 4) Not surprising, although I think the kickstarter/ publisher one seems high. Probably skewed by the sample audience. My FLGS have decent prices, and I wait for sales, so I try to shop local. BUT, I’m not sure how that would change if I lived in the USA. I drool over the Amazon deals you guys have! 5) I like the idea of campaigns, but they take a time commitment. It took us a year and a half to finish the Imperial Assault Core game. Hard to want to play more than one concurrently. Sorry, that got really long! Suburbia taught me, hard, that length of rulebook has very little correlation with how difficult a game is to learn from the rulebook. That book’s only about 6-8 pages, but is really difficult to use. The game’s not even hard to teach, but… A 16 page book with more illustrations, and a larger font size, would have been far easier to learn the game from and reference. So, yeah, rule book length matters very little for how willing I am to teach a game. (And I definitely factor in player count. It needs to play 2 well, or look like it will solo well if I’m not sure my husband will enjoy it, for me to pick up a game for the most part. RE the Campaign games, I have played four of them this year. I have finished one of those four (Pandemic LS1). The other three are still ongoing (Charterstone, Pandemic LS2, Risk L). The first Pandemic took us a solid year and a half to finish. Of the three unfinished, Charterstone is the furthest along, and I hope to make more progress over Christmas holidays, but don’t expect to necessarily finish it then. I am not sure when the other two will get finished. The problem is exactly as stated, its hard to get a group together to play consistently. Which means that I will only buy a new one when I know I will be able to have a semi-regular group to finish it with, or when one of the others is finished. Regarding the rulebook. Length is not as important as clarity. Lengthy but clear, concise and easy is better than short and muddled. Love FFG’s Learn to Play + Rules Reference booklets. Hate CGE’s ‘easy’ rules/’normal’ rules booklets. There was an interesting thread on BGG asking people for their favorite, least favorite and most overrated games out of the top 100. It was all over the shop! One person’s favorite was another’s least favorite was another’s most overrated. I suppose there has to be a linear ranking system like that on BGG but its relevance is limited. Having said that, it’s where other people look when they want to buy me a christmas/birthday present! There only question mark for me would be if a game cannot be played with less than 3. At 2 players I only need to consider if my wife would like playing it. At 3+ I have to think about whether it would get enough table time. I like reading a good rule book like a GMT game for a game I’m planning to play, but when it one we have just pulled out on a Games night I want to be easy to get going. For the player count, When at home my count is one. But on a Games night it’s 3-4. I couldn’t choose both. It’s very interesting how 2 player is so important. 57.9% in your survey regularly play at the 2 player count. I don’t think putting the rulebook page count on the box will help unless it’s 8 pages or less. As a well made 32 page rulebook could have less text and be easier to comprehend than a standard 16 page rulebook. Rahdo got very angry recently about rulebooks. He thinks a dramatic change is needed in the industry. I’d rather read a 100 page rulebook in comic form, if anyone made one, than a standard 32 page rulebook. I’d bet it would be quicker to read too. If 58% regularly play at 2 players vs 33% regularly playing at 5-6 (With the wording of the question it’s hard to isolate regularly playing at 5 from 5-6 due to the two values of consistently varies, but equally hard to isolate 2-3 from 2-4, or 3-5 from 2-6), does it start to make more economic sense to include extra components for 2 players where that enhances the experience than extra components for 6, in the same way Stonemaier includes extra components for solo? I’ve never had an issue with a Stonemaier game at two players myself, but I could see a situation where a game’s an 7-8 at 2 but a few bits specifically for 2 would up it to an 8-9. I’m fairly sure I have at least one game from another company on my shelf I think that about. Alternatively, does doing so send alarm bells to people who’ve been burnt by dummy player systems in the past? As for rulebooks – I firmly believe more game publishers need to hire technical writers specifically to write rulebooks. From a writing perspective, rulebooks are technical documents that are trying to do two things at once, and that’s a hard prospect for someone who’s professional skill set may lie elsewhere – They’re documentation that are simultaneously needing to serve as a teaching guide and a reference book, when the correct order for laying out information for both of those often differs. I think Stonemaier has some good examples of rulebooks, but I don’t actually know for sure how well they work as teaching guides because I usually watch the Watch It Played video before reading them. I like the approach I’ve seen in a couple of solo games of a separate reference and tutorial book where the tutorial book has you play through a game as instructed, referring you to the main rules for reading as and when that helps contextualize what you’re doing, but I’m unsure how well that would work with a multiplayer game. Jamey, I was interested to see if the “think twice” price point percentage went up or down this year. Gerald: I changed a few of the price tiers this year, but the data from last year indicated that about 30% of people will pay a maximum of $60 for a game they really want. Another 30% will pay $70-$80, and the final 40% will pay $100 or more. This year, about 37% of people will pay a max of $60 for a game they really want, followed by 28% for $80 and 34% for $100 or more. Thanks. That small drop reflects what’s people are saying about KS. Really interesting data this year! 1. Rule book length – I personally don’t mind a long rule book. But, with a large game collection, some games stay on the shelf longer than we’d like between plays, and it can be a bummer to have to drag out a long rulebook to refresh the rules when a quick overview (i.e. ~2 pages) could do the trick to get playing again. This is lacking in most games on the market, and I’ve started writing up my own quick-start guides for our collection. I’d really like to see more included with the rulebooks! 2. Player count – I see what you’re saying about having a 2-5 player range, with an expansion up to 6. The only issue I have with this is the odd number player maximum in the base game. This makes a game playable with one couple, but not two (which eliminates MANY of our games from being played with our families, which total 6 people). On the bright side, we almost always use that as an excuse to buy an expansion that will take our game to 6 people. 3. 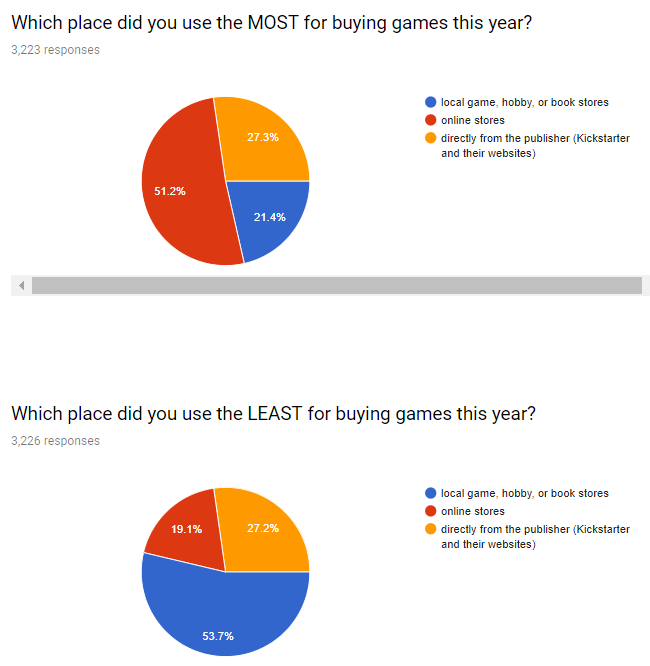 Legacy games – I was very happy to see that most of the respondents are playing legacy games. They’ve really added a fun, new element to our gaming experience. As I typically play with just my husband, it’s very important to us that legacy games are playable with two people (Yay Charterstone!) and ones that aren’t are collecting dust. Keep up the good work! Can’t wait for Wingspan! I took the survey here are a few of my thoughts I would have added if there were a comment section. As far as rule book lengths are concerned, personally it doesn’t matter since I learn not only from the rule book, but also from videos if available. But, if the rule book is in excess of 15 pages, a quick play guide with references to the larger rule book page would be helpful. I must admit I don’t rate games on BGG. In fact I have rated just 1 – Scythe. An occasional reminder either posted on the FB game pages or in the newsletter would prompt me to do so. Maybe an occasional section on the newsletter like “What games did I rate recently” with a comment on the end asking what games has the reader rated. Now that I’m thinking about it I will go rate a few games I have played recently when I’m done writing this. I mostly play games with the local board gaming group so I prefer games that scale well for 3 to 6 or even 7 players. I like that you consider the price point when consider number of players. Adding an extra player or 2 through and expansion is a great solution. If the expansion is just to add players, I would like to see it released with the base game, if at all possible. On the topic of buying games my philosophy is this. I prefer to buy from small businesses. How I do this with games? If the game comes from a small publisher such as Stonemaier I will make every attempt to purchase from them directly. I will also buy a game through Kickstarter if it is from a small or new publisher, not so much if they are established retailers using Kickstarter for preorders. Second, I will go to my local FLGS. Next from online stores such as Miniature Market. When talking about buying online, I believe a distinction should be made between companies such as Miniature Market and major retailers such as Amazon. One point you didn’t address is the secondary market. How does the secondary market affect publishers? This year I didn’t play any campaign or legacy type games. Not because I didn’t want to, but because life happened. I think there is a difference between “I want to but didn’t have the opportunity” and “I don’t like those type of games”. I personally own 3 of these type games (including Charterstone and RoF) and am looking forward to life letting me get them to the table. I’m not sure how the distinction would help a publisher, but I think that it is important. Thank you for all you do for your customers and gaming in general. And thank you for reading the musings of a sleep GIG (Geeky Italian Grandmother). Barbara: You’re right, I forgot to mention the secondary market for games–I’ll definitely include it on next year’s survey. 2) We play a few games extensively these days, so rating them publicly doesn’t take as much time as debating them. I prefer words to star ratings too, which influences how useful I think rating my games is. 3) For a family of 5, a game needs to fit 5 players if it’s to be a family game. And, for us, board games need to be family games since we have the mini games for everything else. Being able to work with fewer player is also important since our youngest is nearly 5 and some games are beyond him. 4) We used to try to buy a lot locally, to support the FLGS, but we’ve switched quite a bit to online because of the price difference AND lack of time to go shopping. 5) I answered 3 to campaigns, but I counted IA and the fan-made x-wing campaign in that count… We also tried Gloomhaven, but the kids are not there yet. Boardgamegeek also includes “weight” as a rating for a game. Although of course still subjective, it feels like a better indication of complexity than the rulebook length. Usually our gaming group does the bulk of our yearly purchasing in Essen/Spiel. As such it is essential that the rulebook is available online. IMO if you want to stress how easy a game is to learn you could promote “watch our 15 minute youtube Get-Started video explaining the rules and playing a round” on the box, specifically stressing the short length, while for complex games the draw might be to refer to the “Lets’Play” videos. Length of rulebook: I tend to like complex games, and complexity means a longer rulebook. It’s definitely more important to have clear instructions, rules, and examples than it is for the rulebook to be short. The how-to-play videos are also helpful for clarifying points sometimes. Ratings: I think it would be helpful to remind people (or inform them) about BGG in general. Most people like to support companies or people whose products they enjoy, but they may not even know about BGG. Plus, if you let people know some features they might not know about and also ask them for ratings, you’re giving them something useful, so hopefully they’ll give you a rating that’s useful in exchange. Campaigns: Charterstone was my first campaign/legacy game. I’ve played it through twice this year–once with just me and my husband and once with our regular group of 4. I bought The Rise of Fenris for my husband for Christmas this year, and I can’t wait to play it. I love the story aspect. It’s like reading a book or watching a movie, but while doing something active. In other words, it combines multiple things I love to do. Please keep making them. Number of players: The number of players definitely impacts whether I’ll buy a game. I can play games with my husband every weekend or more often, but my regular group of 4 only gets together every other week or so. If it’s a game for 3+ players, I’m less likely to buy it simply because it’s not going to be played as often. Plus, I like to be able to try out a game before introducing it to the group. Thanks for sharing the results. They were very interesting. Thanks Crystal! I really like your idea about adding value to people by teaching them about BGG (and hoping that a few of them will proceed to rate games). Not that you want to advertise a third party platform in your games, but perhaps a small 1/4 page insert in all game boxes driving users to visit BGG, rate the game, and then join a Stonemeier BGG group to discuss other projects, etc. “Dig this game? Head over to BGG to leave a rating, and join other enthusiasts to etc., etc. I’m fine with sending people to BoardGameGeek–in fact, on our rulebooks we specifically mention BGG as a place for people to ask questions. :) I hadn’t thought about also recommending that they rate our games there, but I like the idea! – we have people miss RPG sessions all the time. But because the game-to-game interaction is co-op and primarily narrative it’s easy to accomodate differing player counts or even have stand-ins. In contrast, because Charterstone is competitive with a heavily mechanical game-to-game carryover, it’s really important to be able to assemble the same group of players every session. * Complexity & replay-ability & casual gaming: I play Star Fleet Battles & Battletech and really enjoy them. These have large rulebooks with a lot of detail. But the focus is on the scenarios and the various tactical situations; the rules provide a standardised mechanism for resolving them. I am also cultivating a smallish but invested play-group for these games. I don’t enjoy structured tactical war-games (e.g. X-Wing or Warhammer) as much, since it feels to me that a lot of the “game” is in building the fleet / army; the actual “game” feels more like a test engine for the army building. But to introduce someone to any of the above, I basically am saying “invest in this game”. I don’t just mean financial. I love Agricola, but it’s a big ask to say “play this game 5-6 times, and then you’re in a position to really start playing”. My ideal game for family / casual play takes less than an hour to play, can be explained in 5 minutes, and yet has depth that one is still discovering new tactics after 10-20 play-throughs. Clank! comes closest to this ideal for me. I can say “here are the basics, start playing, you’ll get it within 3 turns” without risking someone completely botching the start and setting themselves up for failure. Alternatively, the game needs to be quick enough that one can play a “learning” game without taking up the whole night. Glory to Rome and Race for the Galaxy both fit this criteria for me. There’s no way you’ll win your first game, but by the time you’re done the rules will have been internalised and the experience will be fun enough that you’re ready to try again. * Rulebooks: My ideal casual game has a very short “core” rulebook. Ideally, I can explain all the key gameplay factors to someone and have them keep them in their head. The rest of the rulebook can be a reference manual dealing with odd interactions. Putting effects on cards or similar helps with this (but does make the game language-locked). Alternatively, you need to do something like Charterstone, where the rules are introduced as-needed without giving players a big advantage if the already know them. Also, consider that in a slightly more complex game the rulebook has two functions. Initially, it’s a “how to get started & play” guide. Thereafter, it’s a reference manual. There’s a lot of benefit in actually having two distinct rulebooks – one which is written for people who don’t know how to play, and one which is written for people who do but need to be reminded how a particular rule works. * Player counts: working with anything from 2 to 6 is a really big plus. Even better if you can do it without massively scaling play time. Simultaneous play games can really help here (e.g. 7 Wonders or Race for the Galaxy). Make sure you don’t have simultaneous “play” but scaling resolution time. – and/or the game is short enough that if I end up with in an unlucky situation I can just try again next game. The worst, for me, is a game where it becomes obvious I can’t win but need to go through the motions for the next few hours (and the only way I can “actively participate” is some sort of king making). I value the learnability of a game very much. Possibly in part because I’m most of the time the one reading the rules of games and teaching them to my friends (in board games bars context in particular). But also because … well, the lower the barrier to entry, the better. There are many things that affect the learnability of a game. Beside the streamlining in the design, the rulebook carries much of the effort. It can be clear, well-organised, with plenty of pictures (which will take a lot of space), etc. Also, the size of the font may be big or small, the format of the rulebook can be “pocket-size” or about 15cm by 25cm. There are so many things that in the end, the number of page is probably a poor proxy for measuring the learnability. Thanks Fearno! I like the idea of putting the teaching time on the boxes (though I could see that being highly subjective, as people teach games in different ways). Point 2: I think that the style of game matters to whether folk rank. But also the way it’s sold. In A Bind and Yogi are almost the same thing. Yogi (thanks to the distribution/marketing of Gigamic) has sold about 30x more copies at this point. 6 months ago, it had sold maybe 20x more copies, so those would have actually had time to be played by this point. Even this month, almost 2 years after I stopped selling it (and a couple of months after retailers have run out), IAB is still getting ratings. I hypothesise that because Yogi looks like a mass-produced thing, people don’t necessarily want to engage with it on a deeper level – maybe they consider the folk behind it unapproachable. I heard from a shop that the ‘scrappy’ look of IAB actually worked in its favour in their shop whereas the slicker Yogi is less popular, surprisingly! I guess the lesson is to have a personal touch. For W++ v2 and Kitty Cataclysm, I’m using half a page (of each 2-page rulesheet) to write about the history of the game and thank a few folk. I don’t expect most folk to read it, but I thought that the minority who will read it will enjoy that section. A few also have contact details in case folk want to engage further. I hadn’t previously considered it in the context of BGG votes, but it’ll be there to remind folk that there are actually people working hard on these things and we’d love to hear what you think. I hadn’t ever-before thought of Brad Fuhrman’s idea of pointing folk at BGG and reminding them to rate if they want. But it’s something I might well do for my next next things. 1. Rulebook – An intelligently designed rulebook with concise explanations is far more important than length. Ultimately, however, the rulebook won’t influence my purchasing decision. If reviews are good and I’m excited about the concept, I’ll likely buy the game even if I’ve heard the rulebook is a mess. I won’t bring a game to the table until I’m confident I understand the rules, but with all the resources available online, I know I’ll get there eventually. As an aside – the “How to Play Scythe” video is fantastic. I love being able to forward a link to new players before their first game. So – while a bad rulebook wouldn’t deter me from a decision – a well made instructional video could very likely provide a little extra incentive. 2. 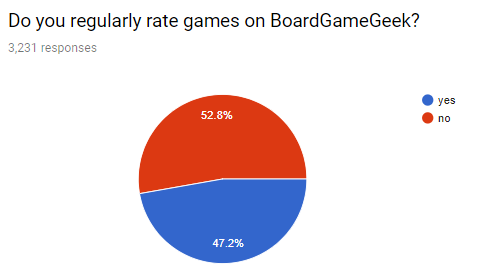 BGG ratings – If you are just using the data to decide how often to remind your subscribers to rate games, then your sample was appropriate and the results are good. If you are trying to find ways to target a more general audience, then you should contact BGG directly for the analytics. 3. Player count – This is one of the most important factors when I consider buying a new game. It’s difficult getting groups together, so if it doesn’t play well at two, than it’s a no go for me. Strictly two-player games don’t excite me much either, so I generally look for something in the 2-4 or 2-5 player range. 4. Where are games purchased from – I’m surprised kick-starter scored as high as it did, but sample-bias might be a factor. Online purchases will likely increase because a) better prices & b) it’s the only way to get interesting titles for the many communities without a local game store. I used all three channels equally this past year, but I prefer the local game store to play-test new games and meet people with similar interests. 5. Legacy games – You could also say that 71.1% played 0-2 campaign games this year. I agree with your theory and think the trend will reverse. The idea is still fresh and exciting, but legacy games are too hard execute in a consistent and meaningful way. Some friends of mine were halfway through Pandemic Season 1, when the other couple divorced and moved away. Now they want me to step in, but it’s been impossible to coordinate. Meanwhile, I want them to play Charterstone and RoF. We’ve played Charterstone once and RoF has yet to hit the table. I’m still hopeful, but it’s a challenge. In that regard, I’ve heard great things about Betrayal Legacy but I just can’t commit to another campaign style game. I did, however, back Tainted Grail on Kickstarter. The only reason I decided to back is because it will play well with two players (or solo).